The wedding couple will be intently listening, so be prepared to give the perfect wedding toast. As a wedding DJ in San Diego I have served as the master of ceremonies at more than 300 weddings since 2002. Generally speaking, every wedding has at least two toasts, one from the best man and one from the maid of honor. Add in a parent speech or two, and it’s not too far off of an estimate that I have sat through nearly 1,000 speeches. If you’ve never spoken to a group of 100-plus people -- and that’s the majority of people I’ve come across -- it’s always good to get a sense of what your vantage point is going to be before the room is dead quiet and 100 pairs of eyes are staring at you. Find out ahead of time where you will be standing for the toast, so you're not caught off guard when it's "go time." As the primary MC, I am addressing the audience in various locations throughout the night. 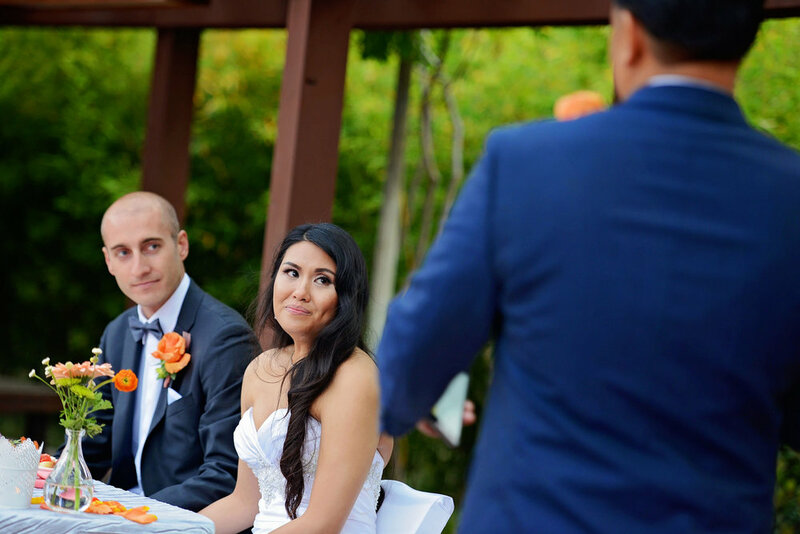 But as a general rule, for the actual “champagne toast,” “best man toast,” “maid of honor toast,” etc., I make sure to place the speaker near the couple. This placement will depend on the type of seating arrangement too. Couple sitting at “sweetheart table”: This type of seating, where only the newly wedded couple are seated, tends to be the focal point of the room. Standing near the table, on the side of the person you are toasting (i.e. best man toasting the groom) is recommended. Couple sitting in the middle of a large “head table”: This set-up can be difficult if the table is real long (wide). Most of the time, the toaster is usually right next to the couple, so it’s easy to stand up from the table and speak. If the toaster is not sitting with or near them, then I recommend taking a similar position next to them. Avoid standing on the opposite side of the table, because this will likely result in having your back to the guests or the couple. Couple sitting among all guests: This seating arrangement is becoming more common because it allows the couple to sit with everyone and not be showcased at a single table. The table they are sitting at will likely be near the dance floor. This makes the dance floor a natural place to stand since you can face both the couple and the guests. Yes, you will have nerves, but keep reading for some tips to help alleviate some of them. Grab a microphone, speak. Seems pretty easy right? Technically, yes, it’s easy. But there are a few things to keep in mind. Project your voice. Just because you are speaking into a microphone does not mean you should speak softer. In fact, you should speak a little louder since a large group of people are listening to what you are saying. Think of it as an amplified conversation. My suggestion is to assume you don’t have a mic, speak at that volume (without yelling) and project your voice. Perfect microphone technique shown here. Hold it right in the middle and place it close to the mouth. Kiss the mic. When speaking, place the microphone almost to the point that you are about to kiss it. Do not hold it down by your waist or at your chest. Lift and place it near your mouth. Yes, it’s on. Any seasoned professional MC, DJ, sound guy should be handing you a “hot mic.” You should not have to worry about turning it on or off, or asking “is this thing on,” and please do not slap the top of the mic. I will never understand why people do this. I always mute the microphone before I had hand it to the person about to speak (unless they are immediately going to speak). I control “on/off” from my mixing board so it’s on when it needs to be, and most importantly, off when it needs to be. Remarkably, I’ve handed a microphone off to people that have literally asked, “what am I supposed to say.” You’ve just been given the honor to say a few words and toast a newly wedded couple … and unless they have just asked you prior to having a microphone handed to you, you owe them a little investment in your time in preparing a speech. Preparation will be different for everyone. It could be some scribbled notes, or full on speech writer, rehearsing in front of a mock audience. Either way, you know what you will need to do, just be sure to do it. You know what happens when you do not prepare and just “wing it?” You end up with a speech that just rambles, lacks cohesion and ensures that the people listening will stop listening. Go into an anecdote about the person in the couple you are closest too. This would likely be the person who asked you to speak, i.e. bride if you are the maid of honor. Start wrapping up this section by sharing something about the couple. This provides a segue to your conclusion. Acknowledge how happy you are for them, this day and being given the honor of delivering this speech. Which brings me to my last tip. You’re almost done you just need to …. I can’t believe how many people finish their speech, exchange hugs with the couple and just sit down? I know, there is a relief to finally be “done,” but don’t forget the most important part of the toast … THE ACTUAL TOAST. Don't forget at the end of the speech to do as Pink says, "raise your glass." You’re done. 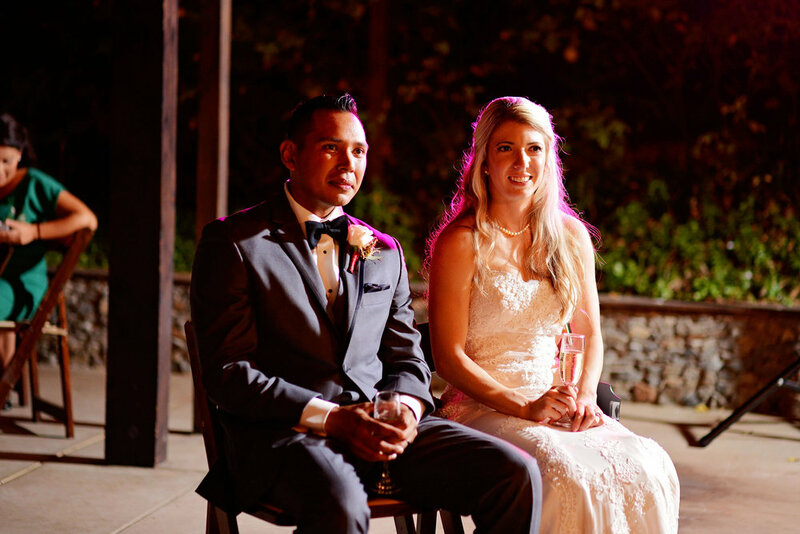 Follow these tips and be firmly planted in the “good” wedding speech file. And best of all ... now you can go have a drink. Note: Thank you for Cate Batchelor Photography for the awesome toasting photos shown in this article.